Needless to say, many of you have already heard that Lancome has launched Golden Hat Foundation Holiday Collection 2011 to support Kate Winslet's "Golden Hat Foundation", a charitable foundation for autistic children. In Support of Kate Winslet's "Golden Hat Foundation", Lancome Malaysia has organised "Golden Hat Foundation X'Mas Makeup Look Contest" to all their fans. It's free and Lancome welcome everyone to join. RSVP for Lancome makeover at selected Lancome counters. Snap a picture and send to Lancome. That's it. For more information, feel free to visit Lancome Malaysia FB Note. I have joined the contest. To all my readers, do take part too yeah. Who knows we might just win Lancome Golden Hat Foundation Holiday Collection 2011 worth RM 200. Lancome cosmetic used for my Makeover, including the lovely Golden Hat brushers. 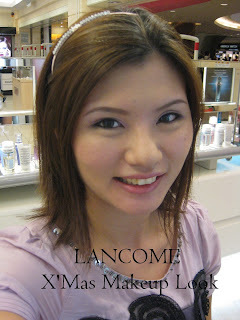 I love my Lancome X'Mas Makeover, it's sweet!